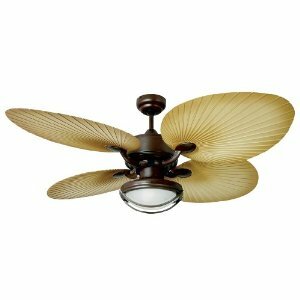 It is one of the popular styles to have a ceiling fan with blades made to resemble palm leaves. 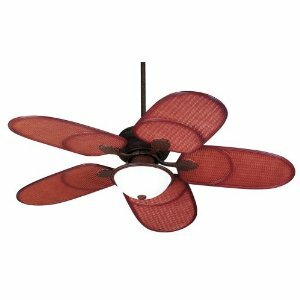 Fanimation and Emerson were among the first to offer this design (and make the very best models) however almost every company nowadays offers a fan in a similar style. Keep in mind that because of the blade design these fans may turn slower than conventional fans and therefore move less air. Some companies (particularly Fanimation) offer fans with two or more palm leaf blade sets attached to a single fan assembly. 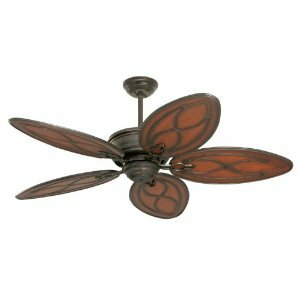 These allow for very unique ceiling fans, as well as fan systems for larger rooms. See " "Fanimation" for more details. For those who want a tropical appearance but not necessarily the palm leaves, there are many other style options. Companies such as Fanimation, Emerson, and Casablanca offer sailcloth blades. Many companies offer fans with wicker blades such as Hunter's Tropical Original. Other options include bamboo, "bent" wood, and blades carved into leaf shapes. Again, as with pal leaf blades, keep in mind any blade shaped differently than the conventional ceiling fan may be sacrificing some speed and therefore air movement for design. 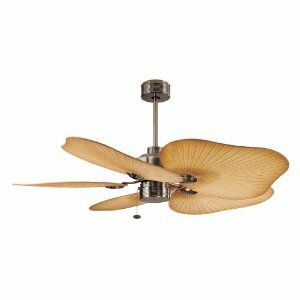 Many "tropical" ceiling fan designs are UL listed for Damp and Wet locations, if you wish to install the fan in an outdoor location make sure it is approved.